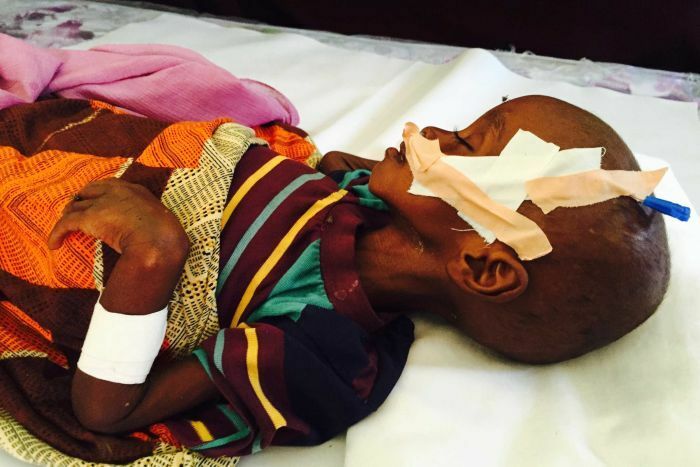 (ABC)- Africa correspondent Sally Sara reports from the General Hospital in the city of Burao. It's hard to know whether to write this story in a whisper or a shouting rage. A whisper for the families and their suffering. Or a furious shout at the senselessness of it all. Maybe it's both. 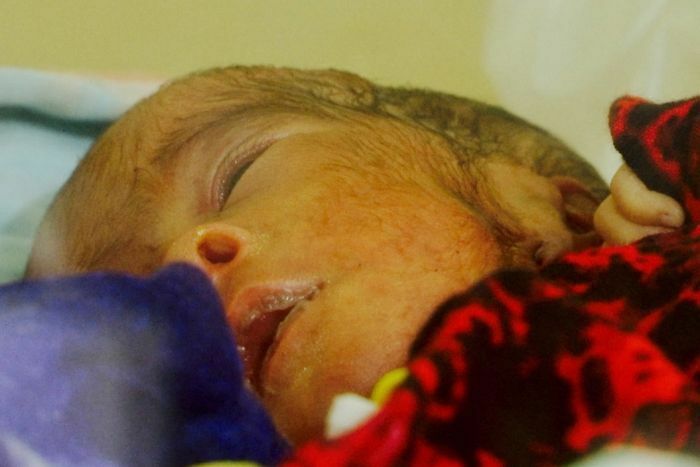 It starts with a beeping sound and the huff of an oxygen machine in the neonatal ward. A tiny little girl flexes her hands and slowly wriggles, tucked away in a home-made humidicrib. She has fine hair on her face, normal for a premature baby born at 28 weeks; it's hard not to look at her. She only weighs a kilogram. Her twin brother died during birth. It was a sudden, bloody arrival. It left her mother mourning and rejoicing all at once. The baby girl doesn't have a name yet. Her parents don't dare, in case she dies too. The doctor gives her a 50-50 chance of surviving. In Australia, her chances would be more than 90 per cent and she would have a team looking after her. But here there is only one paediatrician. The only one for miles. Yesterday he saw 95 patients. Today is just as busy. The infants haven't tasted the heat and dust yet. I almost want to warn them. "Out there, baby girl, is a ruthless place. Your people haven't had decent rain for two years. Their beloved cattle have fallen, shrunk and shrivelled into the ground. Dead. The dams are full of sand instead of water. And there are three letters that scare everyone — AWD — Acute Watery Diarrhoea. It's close enough to cholera and it's killing children older and stronger than you." The hospital is overflowing with sickness and misery. Patients are on mattresses on the floor in storerooms and conference rooms. Some are in tents. On the other side of town, foreigners dressed in white suits, boots, masks and gloves are caring for the most severe cases of AWD. Outsiders aren't allowed in. "There are naked people in there", we are told. "Ill, naked people, fighting for their lives." More than 50,000 people have already been diagnosed with AWD so far this year in Somalia and Somaliland. More than 730 have died — they are the cases that are known. Others have perished in the bush, far from help. Each village has graves marked with rocks. There are no headstones. Only the locals know the stories and names behind each mound. Somaliland declared its independence from Somalia in 1991. It has its own government, currency and security forces. It hasn't had a major terrorist attack in almost a decade. But breaking away from nations is a messy business. It creates fear of an unravelling of borders and alliances so the international community refuses to recognise this place. 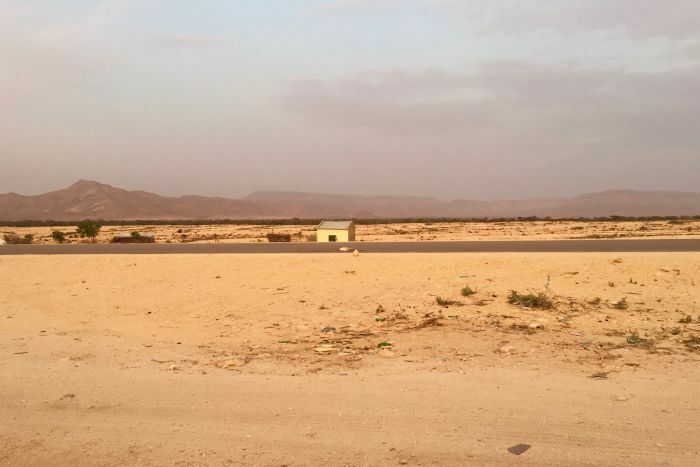 Some aid reaches here, but the government can't get the loans and help that other developing countries can because, officially, Somaliland doesn't exist. In the malnutrition ward, a father sits squatting on the floor. He's been here for 30 days, watching over his desperately ill children. Twelve members of his family have contracted AWD, including five children. The most seriously ill is his daughter. I ask how old she is but he doesn't know. They don't live by the calendar. He looks embarrassed and says she is two-and-a-half. I gently shake my head. She is at least six or seven I tell him. "She is just a long child", he says. We leave it at that. It doesn't matter. The girl is called Canab. It's a beautiful Somali name which means Grape — full of the hope of new life. But Canab is critically malnourished. She lies across her mother's lap, her legs straight in front of her, her arms limp. She is barely strong enough to blow the flies away when they land on her lips. Desperately thin, her skin is stretched across her bony skull, as if it is one size too small. Her brother cries out in pure panic as Canab's eyes roll back in her head. He's guarding her, even though there is nothing he can do. After a few seconds, her eyes roll back. Now is not the time. Not now. Her mother runs her thumb along Canab's collarbone and into the soft of her neck, constantly checking her pulse. It's a rhythm back and forth. Sometimes she puts her fingers in Canab's mouth to clear the way for her breath. The hospital has run out of money. There are too many patients and few can afford to pay. The doctors and nurses haven't received salaries for the past month either. It sets up a terrible inequality from bed to bed in the malnutrition ward. Those families who can afford medication receive it. Those who can't don't. It costs less than $10 for an intravenous drip and medication but Canab's family don't have the money, and they have four other sick children wasting away from malnutrition. So Canab has nothing. Not even a proper bed. Her parents can see other children receiving help only metres away from them, while their own daughter is drifting into nothingness. The doctor in charge is on the edge of tears, because of the cruelty of it all, but there is nothing he can do. The walls of the children's ward are painted with cartoon characters, from better times. It all looks out of place now. Horrible. The mothers here share a blank expression. 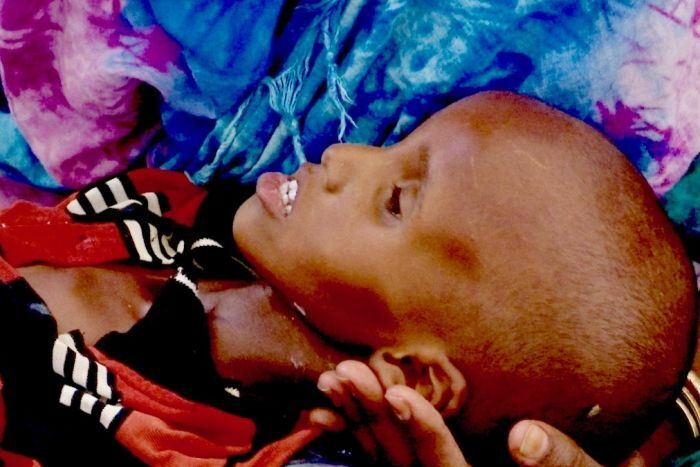 The severely sick children have stopped crying out in hunger. They are silent, big-eyed and still. The night is dry and windy. A shower of rain the day before has already been swallowed by the sand. The drought is bigger than this place, unrelenting. This will be Canab's last night — however old she is. Her parents sit with her, ever hopeful. Their other sick children sleep under cotton scarfs around them. The next day, Canab's life flutters, pauses and disappears. She dies on the floor in the arms of her mother and father. Gone. She dies not because of the drought, but because of a chain of circumstances so complicated and yet so simple, so infuriating and wrong. In a time of plenty, she dies of hunger. In a time of science, she dies without medication. Back in the neonatal ward, the premature baby girl without a name is fighting to stay longer. Her lips are dry as she pushes breath in and out. Her mother is unable to produce any breast milk and unable to afford any formula. They give the little baby some goat's milk instead. It's all they have but it's not enough. The baby dies the following day. Her life lasts only six days. Just like Canab, her death was preventable. The baby without a name and the girl without an age die in a country that the world says doesn't exist. If you wish to help those battling drought in Somaliland, donations can be made through Care Australia.